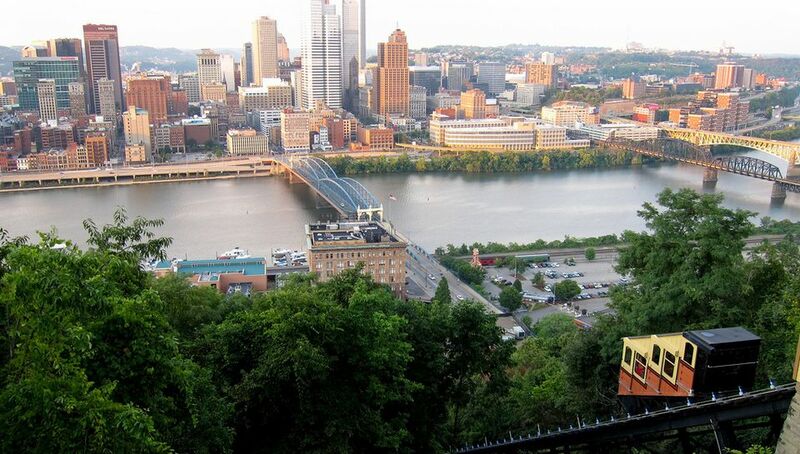 Pittsburgh has two historic inclines: the Duquesne and the Monongahela. Opened in 1870, the Monongahela Incline—called the Mon Incline by locals—is the oldest and steepest incline in the United States. It is also the nation's oldest continuously operating funicular railway. It offers beautiful views of the city, while also providing a convenient way to get to the downtown area from Mt. Washington. The Monongahela Incline is considered the workhorse of the city's two inclines, carrying more than 1,500 commuters every day, but both are worth checking out when you're in Pittsburgh. The Monongahela Incline is owned and operated by Port Authority of Allegheny County and is an integral part of Pittsburgh's public transportation system. In 1974, it was placed on the U.S. National Register of Historic Places and it has also been declared a historic structure by the Pittsburgh History and Landmarks Foundation. Over the years, the Mon Incline has been renovated several times, including to make it wheelchair accessible. By the 1860s, Pittsburgh began rapidly expanding into a booming industrial city. Workers moved up to new housing on Mt. Washington, but the footpaths down to the workplaces were steep and dangerous. At the urging of the predominantly German immigrant workers who lived in Mt. Washington, then known as Coal Hill, the city hired engineers to build an incline modeled after the hillside cable cars used in Germany. Prussian engineer, J.J. Endres was the engineer in charge of the Mon Incline project, and he was assisted by his daughter, Caroline. It was so unusual at the time for a woman to be an engineer that people actually came to gawk. The lower station of the Monongahela Incline is located near the Smithfield Street Bridge, making it easily accessible from Station Square and Pittsburgh's light rail system. Stations are located at 73 West Carson Street and 5 Grandview Avenue. The Mon incline operates seven days a week, 365 days a year. Information about fares and schedules is available from the Pittsburgh Port Authority. The incline is 635 feet long, with a grade of 35 degrees, 35 minutes, and an elevation of 369.39 feet. It travels at a speed of 6 miles per hour and can carry 23 passengers per car.